GIANT, which has more than 20 stores located in Montgomery County, has been piloting Marty in its stores in Harrisburg and Carlisle. Following successful pilots that improved in-store efficiencies and freed employees up to better serve customers, GIANT Food Stores today announced the introduction of a new robotic assistant to all of its 172 stores. “Marty,” a tall gray robot with googly eyes, will soon be working alongside associates, thanks to a partnership between Ahold Delhaize USA services company Retail Business Services, GIANT, and Jabil subsidiary Badger TechnologiesTM. 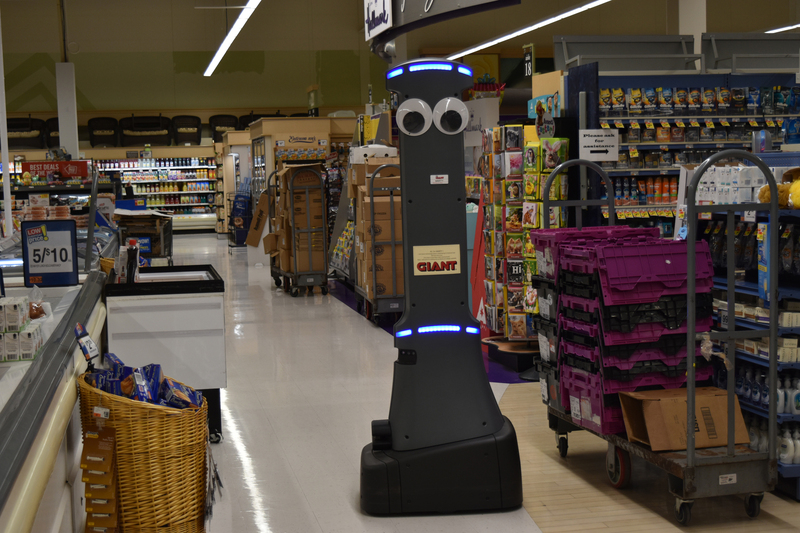 Over the past year, GIANT, which has more than 20 stores located in Montgomery County, has been piloting Marty and the in-store robotic program in its stores located at 4211 Union Deposit Road, Harrisburg and 255 Spring Garden Street, Carlisle. The in-store robots, which move around the store unassisted, are being used to identify hazards, such as liquid, powder and bulk food-items spills and provide reporting that enables quick corrective action. The robots’ efforts free up associates to spend more time serving with customers. They also help stores mitigate risk caused by such spills. GIANT will be deploying Marty to its 172 GIANT and MARTIN’S Food Markets stores in waves over the coming months with expected completion slated for mid-2019. GIANT Food Stores, LLC has more than 170 neighborhood stores and offers home delivery, online/mobile ordering, fuel centers, pharmacies, plus in-store nutritionists. Serving families in Pennsylvania, Maryland, Virginia and West Virginia, GIANT Food Stores is proud to employ nearly 30,000 associates who believe in giving back to their community. The GIANT Family of Brands includes GIANT, MARTIN’S Food Markets, GIANT Heirloom Market, and Peapod by GIANT. Founded in 1923 in Carlisle, Pennsylvania, GIANT Food Stores is a company of Ahold Delhaize USA. For more information visit the GIANT orMARTIN’S websites.